Get them to rent a drop box or dumpster and throw away or donate anything they haven’t used in a while. Convince the sellers to rent a storage unit. After filling a dumpster to the gills, they may still have things that should be moved out of the house — if not out of their lives. A storage unit provides an inexpensive, readily available solution. After these initial steps are taken, you and the sellers can focus on other ways to make the home more appealing to potential buyers. The term staging describes the process of rearranging and decorating a home’s interior in an effort to downplay deficiencies and accent strengths. In its simplest form, staging involves adding specialty accessories like towels, candles, throw rugs, bedding, pillows, dishes, napkins, and stemware. Staging at its most extensive level involves rearranging or replacing furniture or even adding specialty furniture pieces to create a feeling of comfort and livability. Before you advise clients on the staging process, gain knowledge about basic staging techniques and outcomes by visiting newly developed neighborhoods with model homes. Invest the time to see how new homes are being shown. Notice how the most appealing homes present master baths. Take a close look at desirable kitchens to see what is and isn’t on the countertops. Note how towels, dishes, and glassware are displayed. Most of all, study how furniture is arranged in variously shaped rooms to create an environment that is open, warm, and comfortable. When buyers are house shopping, they’re given the challenge of mentally removing the seller’s stuff before deciding whether they actually want to move in. This type of mental gymnastics helps buyers assess how well the home they’re viewing will accommodate their own possessions. Some sellers’ homes are so full of garage-sale and flea-market finds that the buyers honestly can’t see the home through the clutter. They can’t “move in” because they can’t see anywhere for their own things to go. Advise them to remove excessive amounts of accessories and knickknacks. Dismantle the “shrine wall.” A wall of pictures of children, grandchildren, nieces, nephews, friends, acquaintances, and snapshots of every experience the owners fondly remember adds clutter with little to no buyer appeal. Follow the design rule “When in doubt, take it out.” Advise sellers to keep clutter, wall décor, and placement of figurines and mementos to a bare minimum. The point of showing a home is to allow prospective buyers to mentally move in and assess how well the home fits with their lives and possessions. Real estate agents know to listen and watch for buying signals, and one of the clearest and best signs is when buyers discuss how their own belongings may fit in various rooms. Buyers can hardly think about where their piano, china cabinet, or most-treasured family heirloom will go when they can’t get their eyes past the visual onslaught of the furnishings, accessories, and clutter of the current owners. Use the following information to guide your recommendations regarding what sellers should leave in place and what they should move out prior to the home presentation. Pictures: Suggest that the owners pack up all but a few of the personal photos in the home. Appliances: Except the ones that get used daily, store all small kitchen appliances. Leave the coffeemaker on the counter, but lose the blender and maybe even the toaster. Vanity items: Remove most of what is on the bathroom vanity, including decorations and toiletries. A collection of items draws attention to a small vanity size. Closets: Thin clothes out of closets to create the illusion of greater space. Even a good-sized closet that is crammed with clothes looks undersized and inadequate. The garage: Too often, what gets removed from the home goes into the garage. Don’t let your sellers make this mistake. Ask them to move household items into a rented storage unit instead. While they’re at it, they can move garage items — from extra sets of tires to out-of-season recreation equipment — to the storage unit. Then advise them to organize what’s left. The objective is to end up with a clean, spacious garage that adds openness and perceived square footage to the home — and dollars to the final sale price. If you encounter seller resistance, remind your clients that they’re going to have to pack their stuff up anyway. By preparing their home for presentation, they eliminate visual clutter and get a leap on the packing process at the same time. The design rule “When in doubt, take it out” applies to furniture as well. Rooms that feel cramped and hard to move through usually have too much furniture in too little space. Walk through the home to find the spots that feel cramped. Where do transition areas from room to room, or from one part of a room to another, feel restricted? Make recommendations to improve traffic flow. The sellers can’t move walls (without great expense), but they can move furniture that restricts movement. Are too many pieces of furniture crowded into one room? Are furnishings too large and beefy for the room? Does the furniture arrangement work in terms of space and flow? Be on the lookout for small, decorative pieces of furniture. These pieces are often the biggest culprits when it comes to restricting walkways and creating a crowded feeling. Most people have too much furniture in too small of a space. Be ready to recommend that the sellers remove furniture to create more open spaces, which makes the home appear larger and more comfortable. Your furniture-removal recommendations will most likely be met by owner resistance. Sellers will resist because they think that there won’t be any place for people to sit. Stick to your story: Tell them a home with too little furniture almost always shows better than a home with too much. Don’t assume that sellers understand what needs to be done before a showing, even if they’ve bought and sold a home before. Take a proactive stance by providing a detailed step-by-step checklist of the steps they need to take before the first buyer presentation. the Figure is a good sample to follow as you provide your clients with valuable counsel and help them ready their home for presentation. 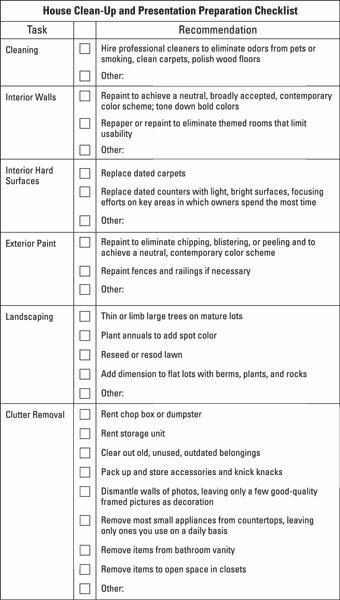 House clean-up and presentation preparation checklist.